Our amazing guest for Episode 22 of the Bean Ninjas Podcast is the founder of The Hands-Off CEO, Mandi Ellefson. She joins us today to talk about how to scale your business. Scaling is the secret to maximise growth and profitability whilst freeing up your time. Freedom and growth are so important to us at Bean Ninjas, that they are actually two of our values (the other is Trust)! This shows just how important scaling is to us, and many of our clients who are seeking to run efficient, growing businesses whilst having a great lifestyle. Mandi has coached hundreds of successful business owners to scale to freedom and manage their businesses while spending more time with the people and on the things that matter the most. Have you ever wondered how the do it? 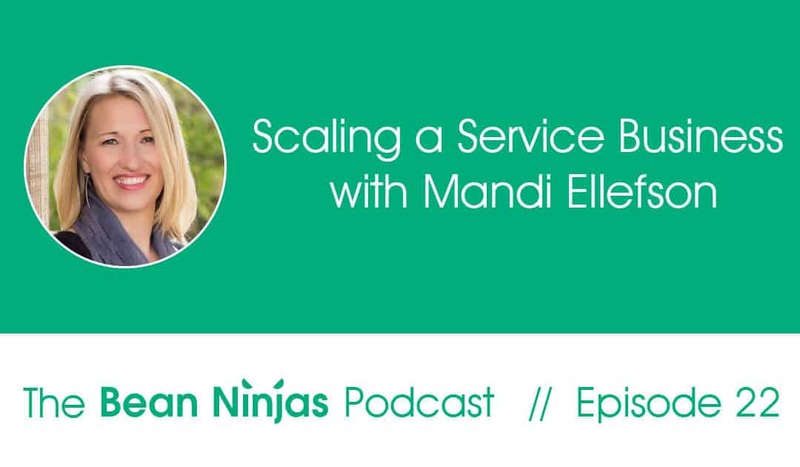 Listen in and let Mandi guide you on how to recover 10 extra hours per week and have sustainable growth at the same time. What does it take for a business to run without the owner? What makes a service business difficult to scale? Finding the right employees to fill a business owner’s technical role. Tips and examples on managing and freeing up time; working on and leading teams; and scaling and leveraging your business. The 5 steps to scale your business and make it run without you. The 5 stages of the Hands-off CEO growth.